The MM1 offers practical features in an extremely compact design. This supremely portable 2-channel stereo mixer gives DJs the control they demand at a price they can afford. 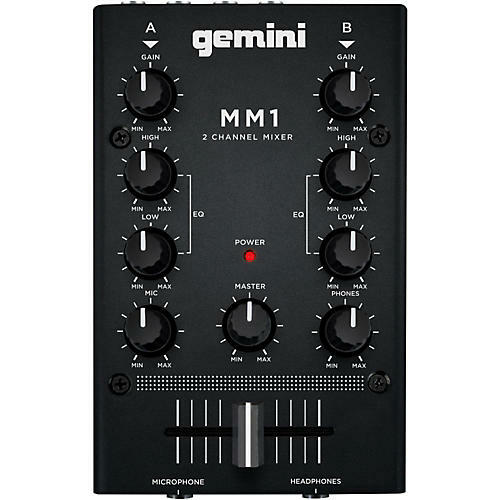 With two line RCA inputs and a master RCA output, the MM1 provides all the necessary connections. For crafting a customized sound, this mixer boasts 2-band rotary EQ on each channel, allowing you to artfully blend the lows and highs of your tracks. And individual Gain Control gives you even greater command when crafting your mix. The MM1 also features a 1/4³ Microphone Input with dedicated Volume Control. The MM1's Headphone Volume lets you adjust the levels heard through the 1/4³ headphone out without changing the overall mix. Using the features to preview your mix helps ensure it sounds tight and professional for your audience. For effortless transitions and clean mixing from one source to another, the MM1 features a smooth, robust cross fader. Ideal for DJ's and consumers alike looking to keep their rig light and tight, along with beginners seeking an easy-to-use, dependable mixing solution, the PS1 offers valuable features and reliable performance at a very attractive price.